Once a year you should pay respect to your employees that have worked hard for you by giving one an Employee of the Year Certificate. Available here on this page is an easy to use template to commemorate the occasion. Here is a step by step guide on how to make this download work for you and some tips on customizing it to your liking. When you open the file provided here, PowerPoint 2003 or another compatible program will open the program. The first step to getting the award ready is to change COMPANY NAME to the name of the company issuing the award. Jump to below EMPLOYEE NAME and change the date to the day of the ceremony. Below the line across the bottom is a spot to put the presenter of the awards name and the title that he or she holds. You now have your template fully customized for the event. At this point, save your Employee of the Year Certificate and continue on with the tips section. Now that you have a customized version of the document you can just simply change the name of the recipient in where the document says EMPLOYEE NAME. Print it out and have the presenter sign the bottom before it gets handed out. 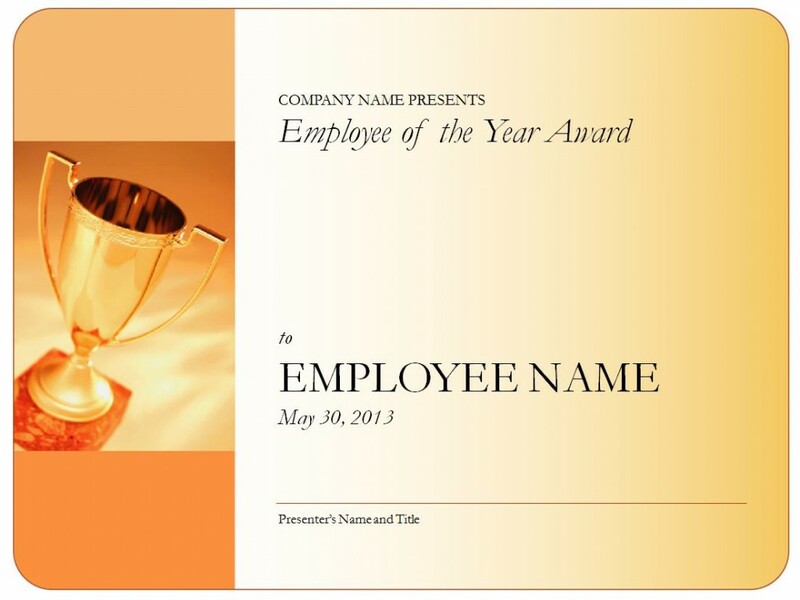 You could also add your companies logo between the Employee of the Year Award and the EMPLOYEE NAME. If you wanted to have other distinct awards simply change the Employer of the Year Award at the top to something that better suits the occasion. If you did not put the logo, you could maybe add a text box and explain a little bit as to why the award was given. The Employee of the Year Certificate is so easy to use and can be customized to fit many different awards quickly. It is available below to download and you can do anything you want with it. Your employee will appreciate the nice gesture and the recognition for their past achievements.